Around 37% of Indians are between 15-34 years of age and this youthful demographic bulge could be our most powerful asset if we could capitalize on it. Apart from career concerns, the young have many other worries such as gaining popularity among peers, living up to parents’ expectations and withstanding the constant pressure to keep up with the current trends. In addition to that some inspired young people have less common passions like love of nature. Some of them are also willing to take responsibility for their surroundings and do something about it. It is this small but powerful group that can bring a real change in the world we live in. Our Green Internship programme is meant for such youngsters. The participants in this programme are students who aren’t happy with the way things are happening around them and want to spend their free time doing something constructive. The Internship was started by CLEAN-India, an urban programme launched by Development Alternatives (DA) in collaboration with IIT Kanpur’s Techkriti 2013- a tech-fest dedicated to the greener good. CLEAN-India got its first batch of Green Interns this year. Twenty two students signed up for six weeks in three cities-Bhopal, Jhansi and Lucknow. They juggled their classes and this internship to work part time on a project they had designed with our support. Some of them worked in collaboration with NGOs like Towards Action and Learning (TAAL) in Bhopal, while the rest worked independently with some schools and colleges. Students worked on issues which are of common concern across time and space, water conservation and waste disposal being two popular subjects as these problems plague almost every city and town in India. To make sure that the students worked according to their own plans they were closely monitored through reports and telephonic updates from the interns and the organizations they worked with. One of the interns was so deeply involved in this part time project that he gave up many evening of casual outings with friends and probably bunked a few college classes, too (an action which we do not encourage). Shashikant Kumar is a student of Electronics and Communications at Oriental College of Technology, Bhopal. He was working with the Bhopal based NGO—Towards Action and Learning (TAAL) on water resources in Akbarpura, a slum in Bhopal, and on the water market in the area. His dedication won him the Green Intern Award. He observed that the water was of poor quality, brackish and yellowish in colour, and there was no infrastructure to ensure regular water supply to the slum. The only source of potable water were hand-pumps installed in some households which used them as a source of income. The hand-pump owners sold water at rates as high as Rs 300 per month for a family of four depending while a larger family had to pay much more. Shashikant realised that the issue of water supply was being faced by innumerable families around Bhopal and this realisation made him think about a possible solution. This six week internship inspired not only Shashikant but also many other college goers. They will learn a lot more in our full time summer internship programme to be held during the college summer break this year. These internships give young people an idea of what is being done in the field by us and many other organisations which harbour the vision of a prosperous, just and healthy India. With this we dispel the belief that there is no solution to the challenges we face today, so today’s generation sees hope and align their work to finding solutions. 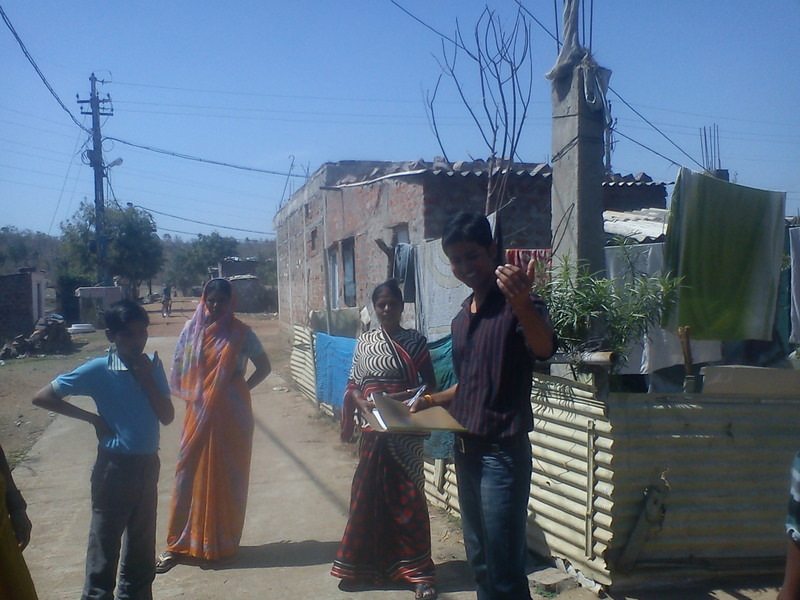 This entry was tagged Green Internship, Sanitation, Slum, Water, Youth. Bookmark the permalink. As the talks about environment continue, there is a huge amount of debate, reflection and comment on how negotiations are unfolding. I personally think that a good, relevant comment is very much needed to keep the conversation going on. In the Internet age, it’s ridiculously easy to spread the word about the environment, but getting friends to take notice and act upon the information is notoriously hard. This write up is going to help in a lot many ways to create awareness and enthusiasm in youth to come up and participate in such a great initiative. This comment is not only to appreciate but also to motivate the initiative. Thanks Soumya! We would love to get contributions from environmental enthusiasts with a gift of articulation of ideas. We thus encourage posts from all CLEAN-India Blog Readers! I feel like this is a compelling program which draws in today’s youth and inspires them to develop their ideas and thoughts on how to help the world as well as hone their skills in this matter. However, I would like to perhaps see an example of a youth my age who engaged himself or herself into working with these projects so that i could get a better feel about what high school students could contribute. Thank you for your inputs and for taking the time to write this comment. We at CLEAN-India are constantly trying to explore ways of engaging youth your age. Can you perhaps give us some ideas which can help us engage more youth who already have their hands full with school or college curriculum?